When a spring breaker is found with his head all but removed along the side of a posh Miami Beach hotel, Lieutenant Nash Harrington is tasked with tracking down the person responsible. But the dead college kid in the bushes is only the beginning. The victim came to town with friends—friends who start dropping like flies. 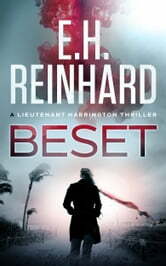 Just as the lieutenant closes in on his killer, the case takes an immediate left turn into the unknown, a place where Harrington could find himself directly in harm’s way. Excellent story full of interesting characters, lots of action and suspense.